One great advantage of the digital TV services is that every TV set has access to subtitles. For the many people with partial hearing loss or total deafness – as well as those who need to listen with the sound off – subtitles allow people to enjoy the TV. 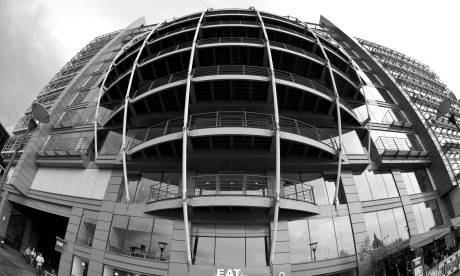 A great deal of thought and effort has gone into providing these services: the laws to require broadcasters to provide them, the technical challenges to make them work and the human time and effort to provide them alongside upwards of 80% of the TV programmes broadcast in the UK. Say hello to Tiresias ScreenFont! This is a special font designed for subtitles on British TV. The proportions of the letters and numbers are designed to allow easy differentiation between similar characters (for example lower case L and number 1, zero and O) and with larger-sized lower-case letters. It also has typewriter-style "a" and long "descenders" (g j q p y) whilst being slightly narrow to get a useful number of words per line. Capital letter (V) height is 20 pixels on a 480-line standard display and at least 50% bright. Usually they have a 100% black background. 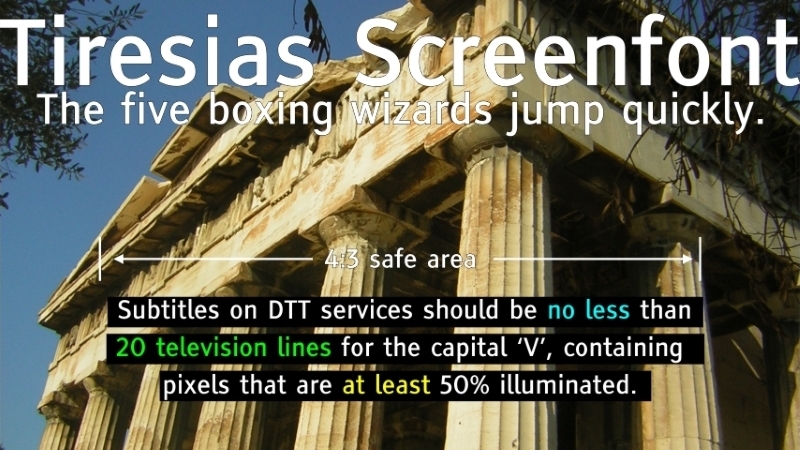 Tiresias Screenfont is required for Freeview, and used for Sky and Freesat. They must sit within the 4:3 cutout so they aren't cut off on an old shaped TV. They should never cover the face of the speaker. They are usually white but can use yellow, cyan and green to denote different speakers. Normally two lines, three are allowed if the picture can still be seen. Words must be synchronised with speech, unless they are being done live. They use a # sign to denote music, CAPITAL LETTERS FOR SHOUTING and mumbling is written out as such. Sounds effects are also written out. With live programmes the subtitles should not run more than three seconds behind live. The law requires that Ofcom demand any TV channel that has more than 0.05% of the viewing provide subtitles. This starts with a requirement to provide 10% in the first and second years rising to 35% (two more years) 60% (another two) 70% (three more) and eventually 80%. The BBC policy is to provide subtitles on "all BBC TV programmes". Here are the list of channels that have to provide subtitles. Why don't channels just provide subtitles? People often ask why channels don't just provide subtitles without being required to. The answer is: money. Providing subtitles is costly and the proportion of costs for a channel with less than 0.05% of the total viewing is disproportionate. Adding subtitles to BBC One, with over 21% of viewing costs the same as for a channel like True Entertainment that has about one hundredth. Whilst it is true that they might get some extra viewers, the cost of acquisition (creating, synchronizing and broadcasting the subtitles) would exceed any extra income they could make from showing these new viewers adverts. It is true that channels often show programmes that have been provided with subtitles on other media (such as DVD or foreign TV closed captions) but if the content has been visually edited for timing or legal reasons, the whole show's subtitles will need careful (and therefore costly) reworking. Which channels will have subtitles in 2016? BBC 1 21.157%, ITV 11.744%, BBC 2 5.116%, Channel 4 4.47%, Channel 5 3.152%, ITV 3 1.23%, ITV 2 1.113%, ITV HD 1.016%, E4 0.817%, Cbeebies 0.808%, BBC 3 0.739%, Film4 0.721%, Dave 0.702%, BBC News 0.636%, ITV 4 0.625%, More4 0.619%, Sky 1 0.573%, 5 USA 0.548%, Sky Sports 1 0.538%, BBC 4 0.529%, ITV +1 0.516%, Drama 0.49%, Channel 4+1 0.486%, Pick TV 0.484%, Sky News 0.452%, Sky Sports News HQ 0.371%, Yesterday 0.365%, E4 +1 0.35%, Sky Living 0.323%, Really 0.307%, Quest 0.305%, Sky ports 2 0.292%, 5* 0.284%, CBBC 0.283%, Comedy Central 0.277%, ITV 2 +1 0.275%, Disney Junior 0.254%, Challenge TV 0.238%, Fox 0.233%, G.O.L.D. 0.233%, ITVBe 0.226% Watch 0.221%, Nick Jr 0.214%, Universal 0.207%, Alibi 0.199%, 4Music 0.193%, 4seven 0.183%, CITV 0.169%, Sky Atlantic 0.168%, Sky Movies Disney 0.158%, Film4 +1 0.51%, TLC 0.149%, BT Sport 1 0.148%, Discovery 0.147%, Cartoon Network 0.145%, Sky Movies Premiere 0.134%, Quest+1 0.129%, Disney Channel 0.126%, ITV 3 +1 0.126%, Dave ja vu 0.12%, Sky Sports 4 0.114%, Sky Sports 3 0.114%, Nick Jr 2 0.113%, Boomerang 0.108%, Nickelodeon 0.104%, MTV 0.099%, Nicktoons 0.099%, Sky Sports 5 0.95%, Sky Movies Family 0.09%, More4 +1 0.09%, Viva 0.089%, Sky 2 0.086%, Sky Sports F1 0.08%, Sky Movies Action & Adventure 0.078%, Sky Movies Showcase 0.071%, Sky Movies Greats 0.07%, Sky Living +1 0.069%, Comedy Central +1 0.069%, Good Food 0.068%, Animal Planet 0.066%, G.O.L.D.+1 0.059%, Disney Channel +1 0.057%, Sky Movies Comedy 0.057%, Sky Movies Drama & Romance 0.057%, BT Sport 2 0.056%, ITV Encore 0.056%, Disney XD 0.055%. Note that BBC Alba, ITVBe, ITV Encore, Sky Sports 5, BT Sport 2 and Fox will start their requirement to provide in 2016. Which channels will have subtitles in 2017? Sky 2 subtitles are rubbish,constantly sticking and missing parts of conversations every few mins.i could go on and on. For people who rely on subs tv is still poor. The provision of subtitles, of whatever quality, is a matter entirely for the individual broadcaster. MikeP: You read the article, right? When are we likely to have subtitles on the horror channel.? You would do better if you asked therm directly as this website has no connection to that programme provider. It is entirely up to the programme providers to supply any subtitles they wish to have available on their service. If they choose not to have them then they will not be available. I suggest you write to the individual programme providers concerned, not this website, asking them about the provision of subtitles.